This is really an amazing cake! 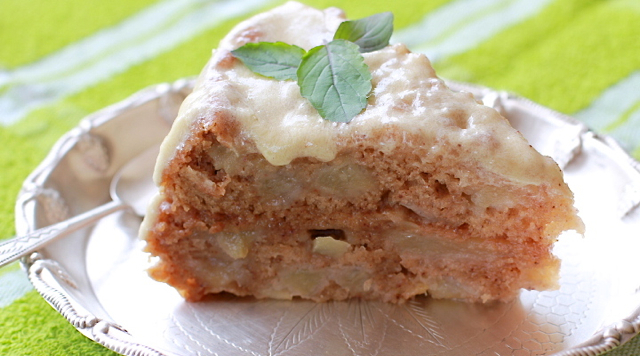 With apples, cinnamon and honey frosting, yum! You have to try it and see! Begin by preheating the oven to 350 Fahrenheit/175 Celsius. The peel, core and chop the apples into small cubes. Set aside. Place remaining ingredients into a large bowl and mix thoroughly. If the cake mix is too thick add a little more yogurt. It should not be too liquid, a little thickness is needed. Once all your ingredients are well mixed, add your apple cubes. Oil your cake pan with ghee generously. Then pour your cake mixture into the pan. Bake for 35 to 45 minutes. Keep checking. You will know when the cake is ready when you poke a knife in the cake and the knife comes out dry. Make sure to let the cake cool before putting on the frosting. Now time to make the frosting. In a medium bowl, using an electric mixer, beat confectioners' sugar, unsalted butter, honey, and ground cinnamon until smooth, 4 to 5 minutes. Then you are done! When your cake is cooled, spread your frosting all over the outside. Slice a piece and offer to Kṛṣṇa with love and devotion!